The inaugural meeting of The New Black Bart Poetry Society was held on Wednesday October 3, 2012. The meeting commenced at 6:00 PM and was held at the River Reader, 13655 Main Street, Guerneville, CA. The meeting was called to order by the Grand Poobah Emeritus, Pat Nolan. Thereupon a general discussion ensued wherein it was agreed the society would not be a forum for individual members to read or recite their own poetry but, instead, would be to discuss the art of various poets and poetry subjects in general. Numerous suggestions for future topic presentations were proffered along with those projected in the provisional Mission Statement which for the time being would continue to be held as a document under review. Grand Poobah Emeritus Pat Nolan thereupon delivered the opening lecture on the inception of the original Black Bart Poetry Society, its history as recorded in the annals of Life Of Crime, its scurrilous newsletter, and the ostensible future of The New Black Bart Poetry Society, a viable community based society of individuals with an abiding interest in the art of poetry. The text of the opening lecture can be read here: The New Black Bart Poetry Society. Irish as Secretary/Historian closed the meeting by presenting an article from the September 14, 1909 Tacoma Times entitled: “Black Bart”, He Gets $3,000 a Year for Being Honest for the record. If you secure an answer to that question, visit the offices of Captain Seymour, head of the detective bureau of Wells Fargo & Co., in this city on the first day of any month between the hours of 2 and 3 p. m.
If you do, you will meet a rather neat old man, say between 60 and 70 years of age, who on entering the room will walk up to the desk of the veteran officer who has brought grief to more express robbers than any man on the Pacific coast, will exchange greetings and will be handed a package containing $250 in crisp bank notes. Should you ask him to talk; he’ll tell you that honesty pays. He ought to know what he is talking about, for for 10 years past he has been receiving $250 monthly from the big corporation and all in the world he has to do for the money is to keep honest. This mysterious old man, if he could be induced to speak further, would tell you that his name is C. E. Bolton. Rather an ordinary name, but should you succeed in getting deeper into his history he may be induced to admit that he is no other than “Black Bart PO-8,” that when in action he is rated one of the most desperate highwaymen that ever waylaid an express agent, and that before he went on the corporation payroll he cost Wells-Fargo $100,000 in express robberies. He was finally caught, thanks to the efforts of the late Wells-Fargo detective, Capt. Hume, but after his release the company so feared his future efforts that they sent for him, agreed to pay him $250 monthly if he would rob no more express boxes, the agreement was promptly entered into, and “Black Bart PO-8” has been drawing his salary ever since. 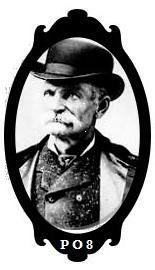 While engaged in his robberies during the ‘80s, Bolton made his home in this city, and much to the chagrin of local detectives it developed after his arrest that he had reckoned them among his friends and had frequently discussed the “Black Bart” robberies with the flower of the local detective bureau. Note in 1900-1910, $250 per month would be equivalent to $7,725 per month in today’s values. Also the $100,000 “Black Bart” stole from Wells-Fargo would be equivalent $3,130,000 in today’s values. Maureen Hurley has written a thorough and imaginative account of Black Bart and his stage robberies as well as posting photograph she took at the First Annual Black Bart Poetry Society Membership Drive and Benefit at the On Broadway in San Francisco in 1983 at her blog, Literrata. An alternate account of the history of The Black Bart Poetry Society can be found in the pages of Exquisite Corpse entitled More Poetry Assholes. This entry was posted in Poetry, Poetry Society and tagged Black Bart, California, California Poetry, Life Of Crime News Letter, Modern Poetry, outlaw poets, Poetry Blogs, Poetry Lectures, Poetry Lessons, Poetry Society, Poetry Talks, Poets, Poltroon Press, Schools of Poetry. Bookmark the permalink. Hello, Mr. Nolan — I encountered your blog while doing a search for you and Keith Abbott and found the wonderful — really wonderful — post you wrote in 2014 about Steve, Lew Welch’s reading at our apartment after the big bash at Glide Memorial, and the collection of Steve’s poems published by Subpress in 2009.